We always like to praise auctioneers who understand numismatics and who write accurate descriptions. 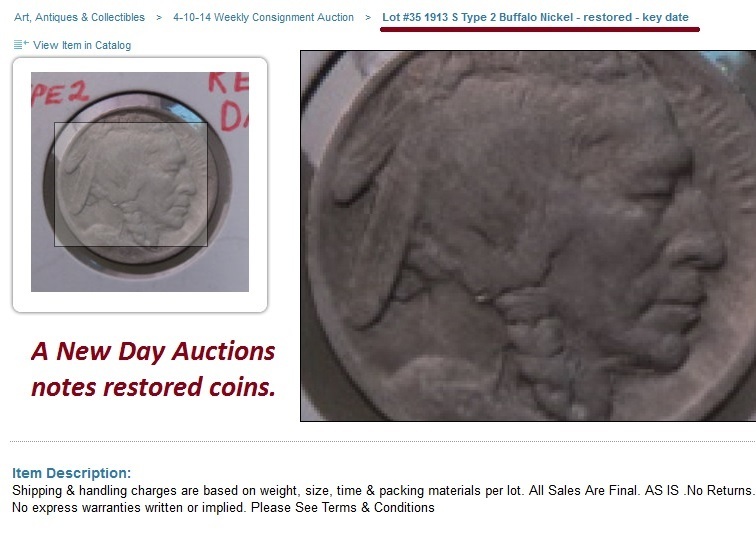 In this case, A New Days Auctions notes in several of its listings that certain Buffalo nickels have been restored with acid. Buffalo nickels treated with vinegar or other acids can be restored when they seem to lack dates from extensive wear. We do not recommend treating nickels with acid as the result is a grainy damaged coin usually now worthless if not a key date. In the example above, a person restored the key 1913-S Type 2 nickel. If an auctioneer, please alert bidders that a lot may be restored. If a buyer, never bid up such a coin unless it is very rare (1918/17-D overdate, for example) and then only place a low-ball maximum bid. This entry was posted in Uncategorized and tagged A New Day's Auction, American Numismatic Association, Auctioneers, AuctionZip, Best Practices, buffalo nickels, Coin Auction, iCollector, National Auctioneer Association, Proxibid, Proxiblog. Bookmark the permalink.